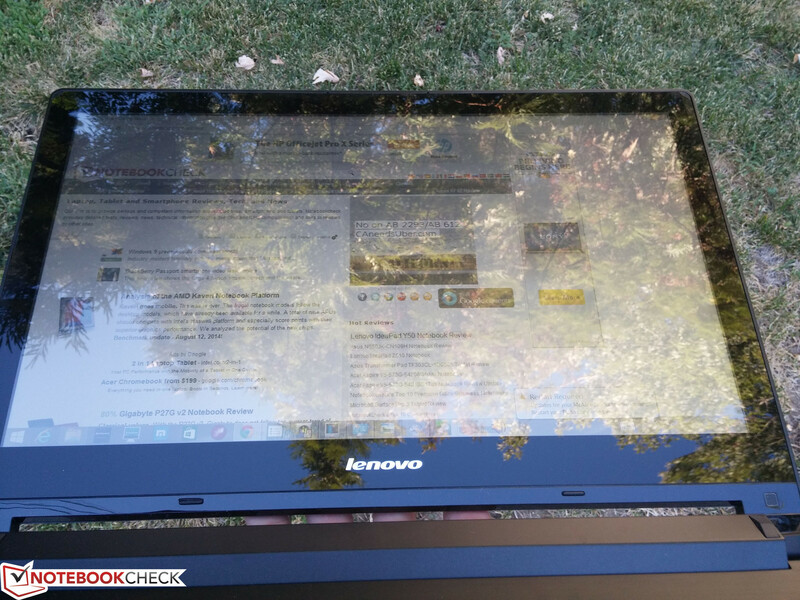 The second generation Flex series has arrived on time as part of Lenovo's back-to-school lineup. The models have been popular with users due to its alluring multi-mode touchscreen design and inexpensive starting prices. We have already published on past Flex models including the original Flex 15, Flex 15D, Flex 14, Flex 14D, Flex 2 14, and the recently released Flex 10. We strongly encourage readers to check out these past reviews to get even more commentary on the Flex series as a whole. Starting at just $549, the Flex 2 15 is already a bargain for home and student users. 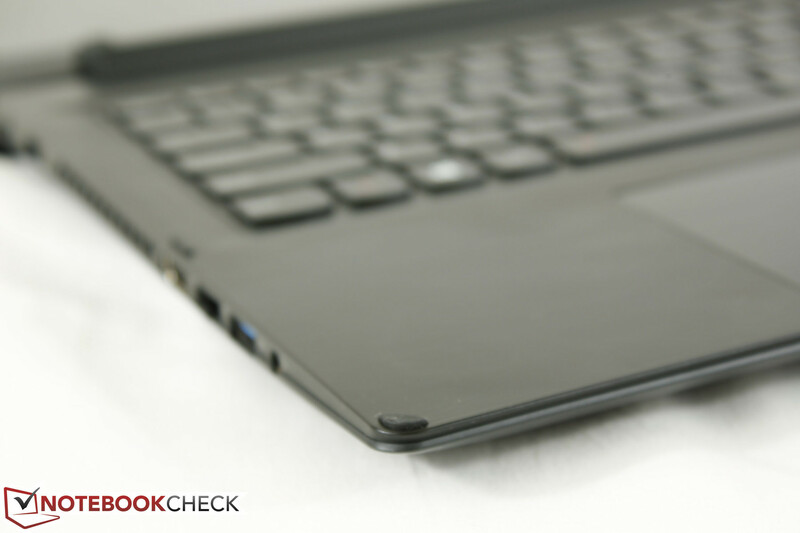 Our particular test model is a higher-end configuration and includes a Core i5-4210U CPU, integrated HD 4400 graphics, 6 GB RAM, 1080p IPS screen, and a 500 GB SSHD. 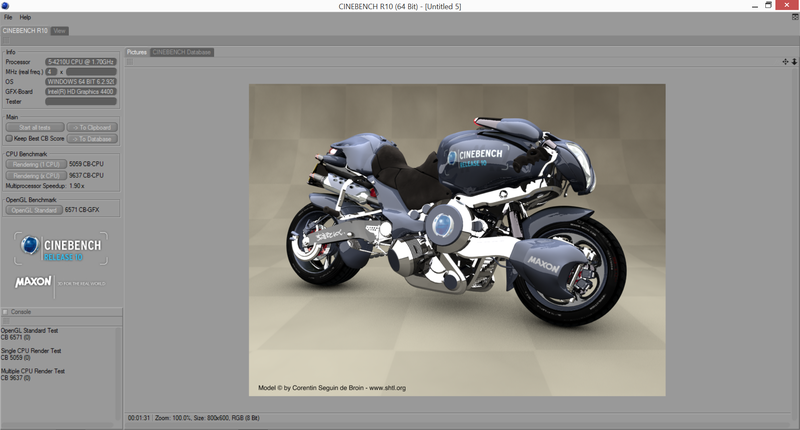 Note that all current models come with 1366 x 768 resolution displays except for the highest configuration. Otherwise, the differences between the models are relatively minor. We take our Flex 2 15 for a quick spin to see how it compares to its original Flex generation and other competing budget offerings in the market. The chassis of the Flex 2 15 has undergone only minor changes compared to the previous generation Flex 15. In fact, a quick glance at both models and the small changes can be easily overlooked. The smooth plastic outer casing and brushed aluminum palm rests have transferred over intact, so the notebook feels similar to yesteryear's model. 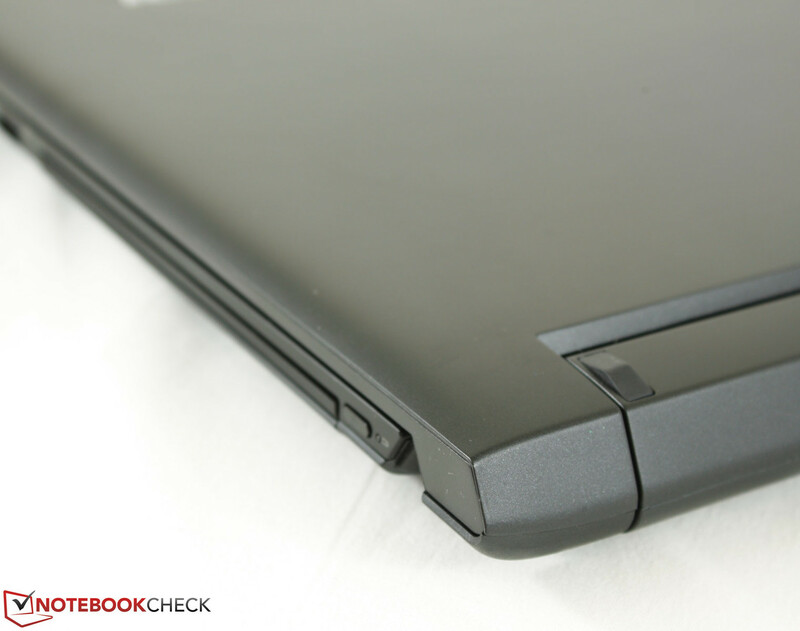 The surface surrounding the keyboard now has a shallower incline with sharper corners for improved aesthetics. Pushing down on the center of the outer lid still results in a moderate amount of flexing and regular typing can cause some flexing of the keyboard as well. In contrast, the palm rests feel solid and certainly more rigid than the rest of the notebook. The display bezel has changed slightly with a more defined edge-to-edge glass cover and a glossier surface to go along with it. 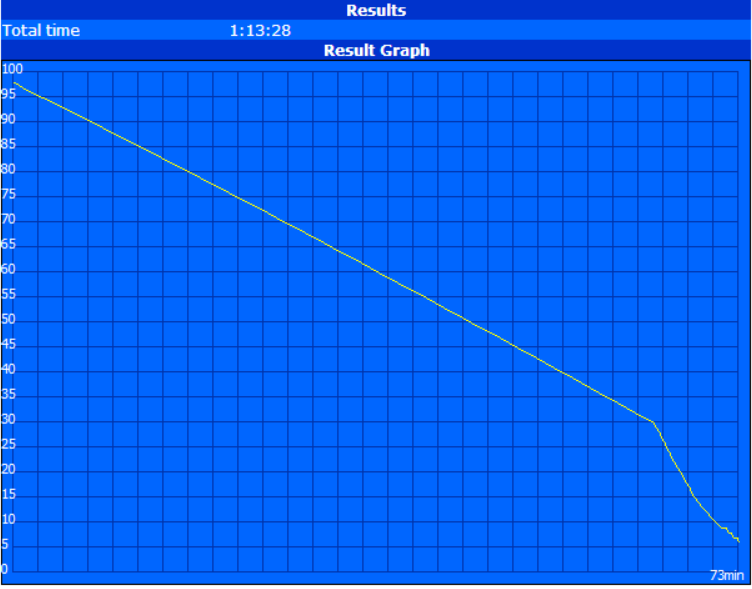 Resistance to twisting could have been better, especially for a convertible, so display rigidity feels average at best. 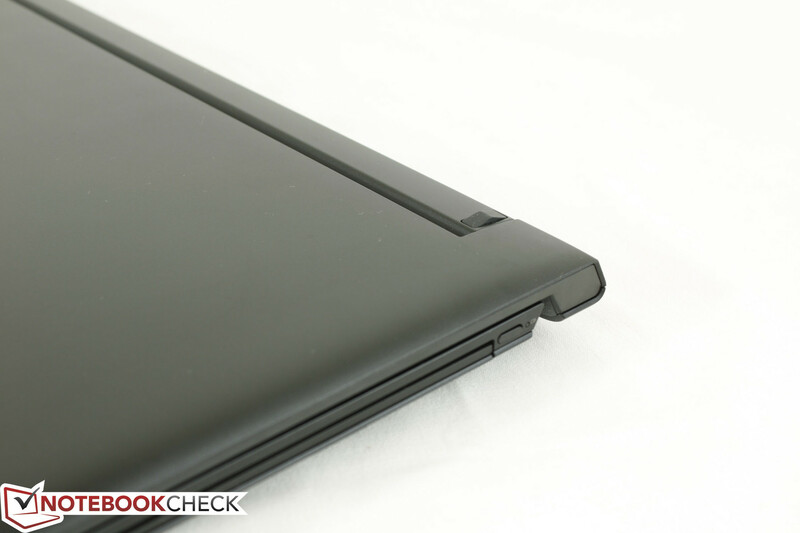 The hinges that give this notebook its name continue to feel taut all the way up to its 300 degree angle, but are not any better than on the previous Flex 15. The display, for example, still wobbles when adjusting to different angles. In terms of size and weight, the Flex 2 15 is essentially the same as the outgoing model. 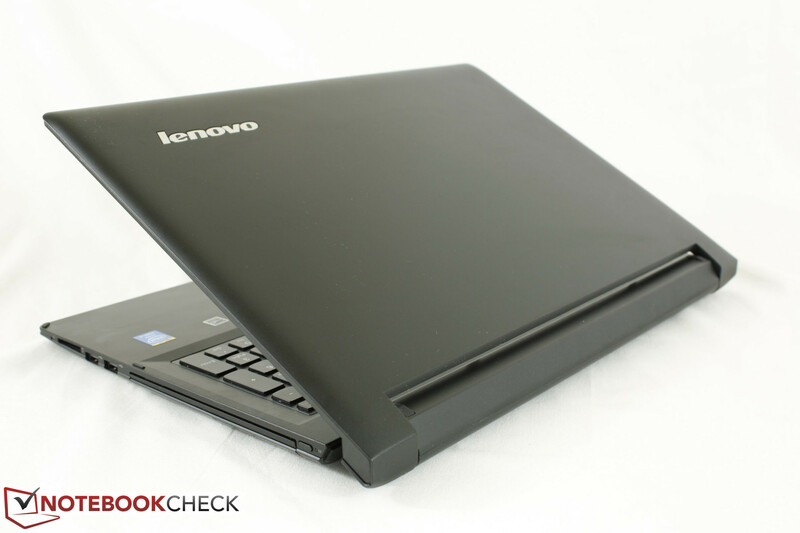 Although its weight is largely uncharged at 2.3 kg according to Lenovo, our higher-end configured model is actually around 300 grams heavier according to our own scale. 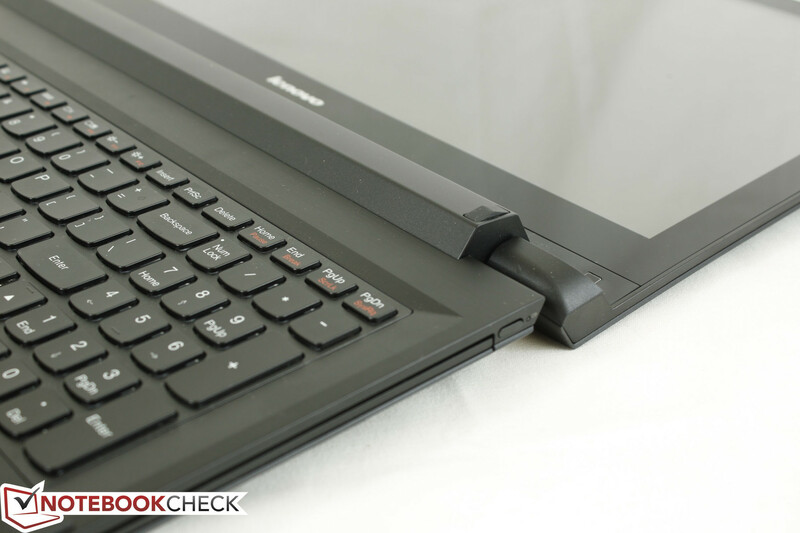 Compared to competing budget notebooks like the HP Pavilion 15, Toshiba Satellite C50D, and Samsung ATIV Book 2, the Flex 2 15 is thinner and sleeker by a few millimeters and up to half a kilogram heavier for a much denser build. 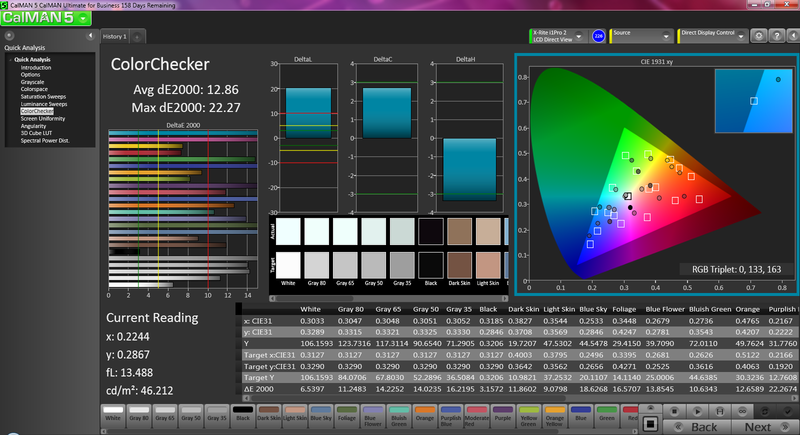 Available interfaces are again similar to the previous Flex 15 with some minor rearrangements. A Kensington Lock is now available adjacent to the AC power adapter input and the 3.5 mm audio port has switched sides. The Power button has been made smaller and the Volume rocker is now gone in favor of an optical drive. Otherwise, available ports are in line with those offered on competing models save for a VGA-out port, which a handful of budget notebooks continue to offer alongside an HDMI-out port. 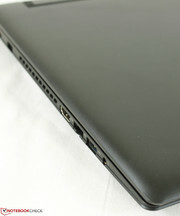 All ports are easily accessible as none are located on the rear of the unit. However, they are quite close to the user on both the left and right-hand edges and can potentially take up valuable desk space. Standard wireless-n is provided by the single stream Broadcom BCM43142 Half Mini PCIe card with integrated Bluetooth 4.0 support. There are no GPS or WWAN options as expected from a notebook of this class. We had no latency or dropout issues when connected to a standard 802.11n network. 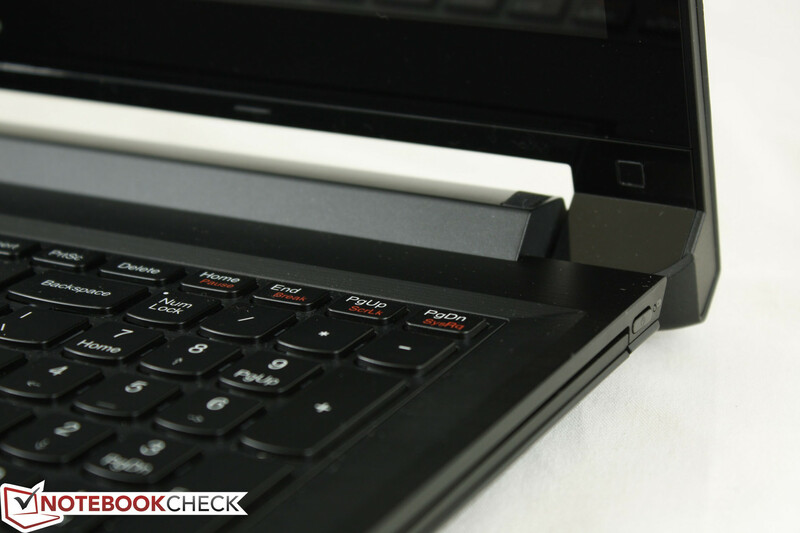 The lack of a dedicated docking port means that the Flex 2 15 is limited to generic extensions. 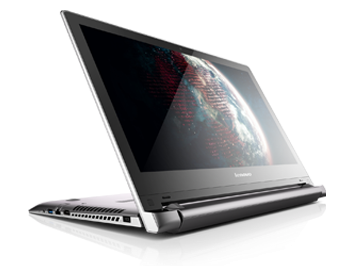 Fortunately, its sole USB 3.0 port allows for a wider range of options than a typical USB 2.0 port and Lenovo offers plenty of official accessories across all of its products including mice, external DVD burners and USB 3.0-based docks. 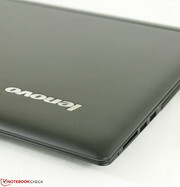 The standard one-year warranty applies to all new purchases directly from Lenovo's online store. As is typical from the manufacturer, warranty extensions are available up to $199 for three years of coverage with accidental damage protection and in-home repairs. The AccuType keyboard (34 x 10.5 cm) looks and feels the same as on the original Flex 15. This unfortunately means that the keys continue to provide shallow travel with unsatisfying feedback when pressed. They also feel mushy and thus inaccurate, especially the small Enter key. On the bright side, the Arrow keys have not been reduced in size and are easy to use along with the Numpad for spreadsheet work. 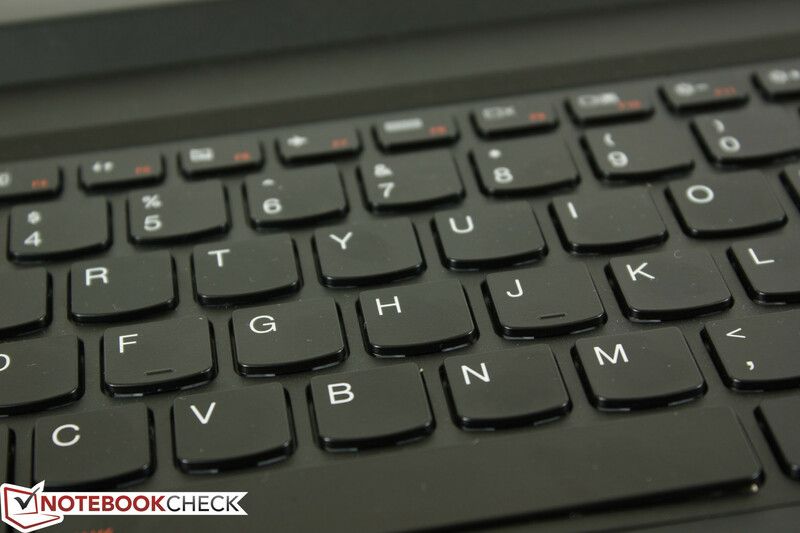 A keyboard backlight is now included, which is not common amongst budget notebooks. As noted earlier, the center of the keyboard flexes easily while typing and contributes to the feeling of mushy keys. 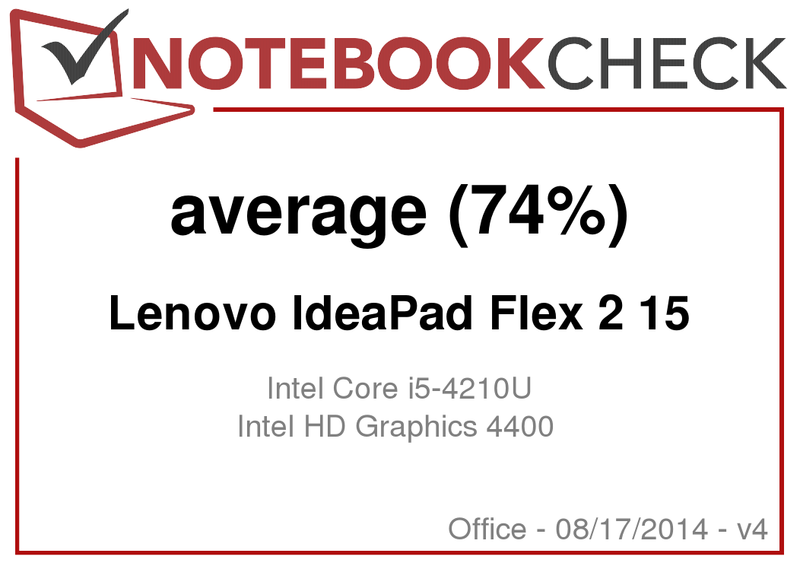 It certainly takes some getting used to, but hopefully this is an aspect that will be addressed in the next iteration of the Flex 15. 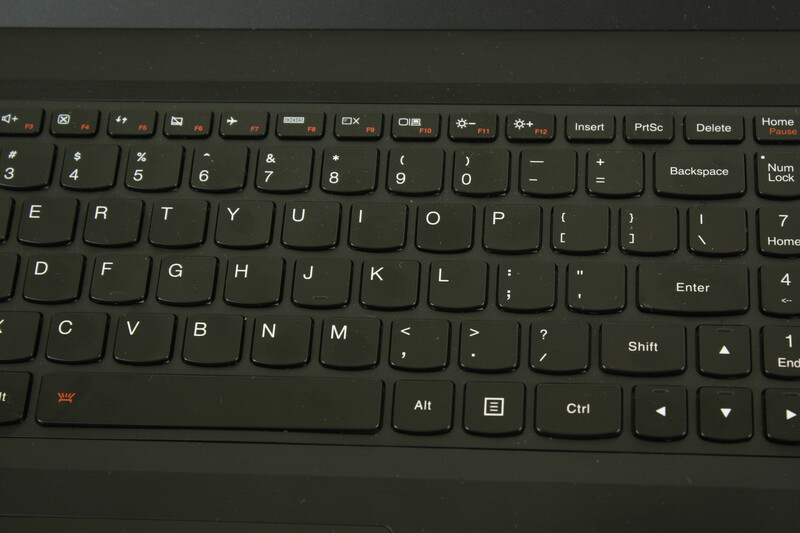 Like the keyboard immediately above it, the multi-touch plastic touchpad remains unchanged from the previous generation. It is still relatively large (10.5 x 7 cm) with a smooth and responsive glide. The palm recognition feature will automatically disable the touchpad if it senses the user's palm when typing. 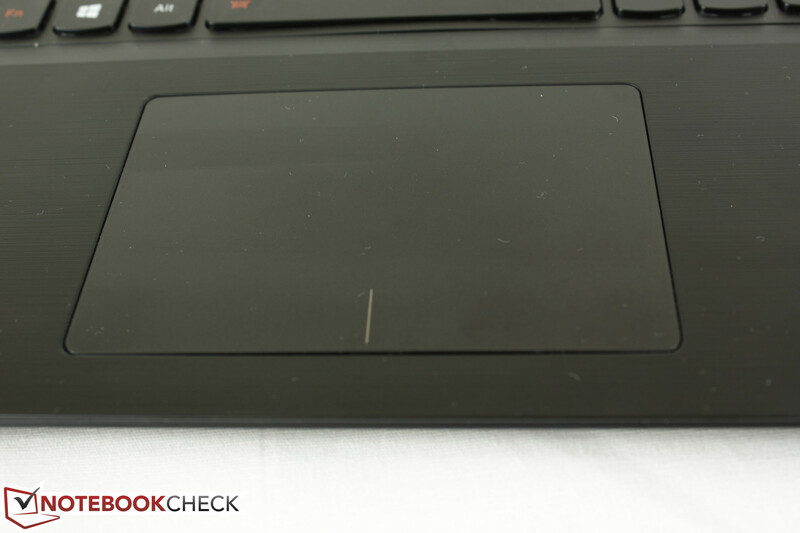 When clicking on the touchpad, both the feedback and travel feel unsatisfactory. There is a noticeable amount of travel before a click is even registered, so the mechanism feels spongy. Zooming is also a bit laggy and visible fingerprints and grease will accumulate very quickly. 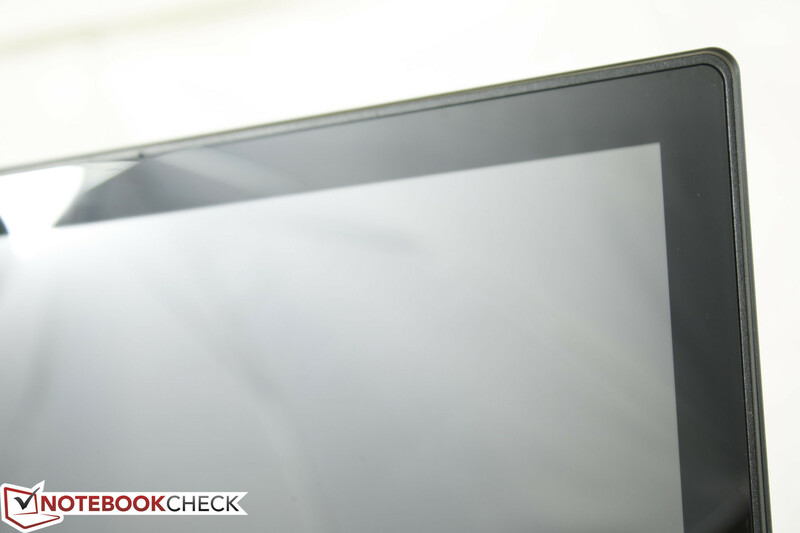 Most Flex 2 15 models come equipped with 1366 x 768 resolution displays while higher-end configurations enjoy a much cleaner 1080p IPS screen. The 768p native resolution is becoming more difficult to recommend, especially for 15.6-inch displays or larger as almost any application can benefit from the extra pixels provided by a Full HD panel. 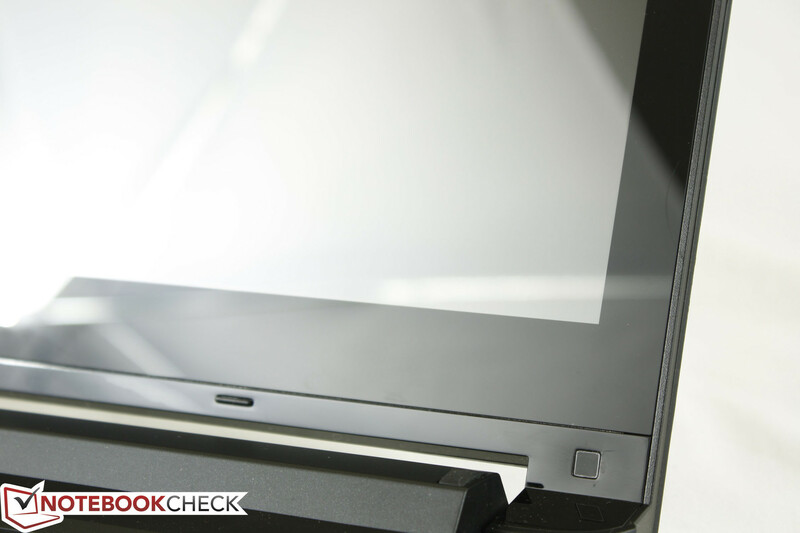 The 1080p screen on our test model appears closer to the surface of the display for a deeper "pop-up" color effect. Though the display received a slight redesign, its maximum brightness and contrast have not improved compared to the original Flex 15. A high or maximum brightness setting is recommended even for comfortable indoor use. Contrast is also poor, but is still acceptable for movies as the IPS panel does not suffer from viewing angle issues during poorly lit scenes in movies. 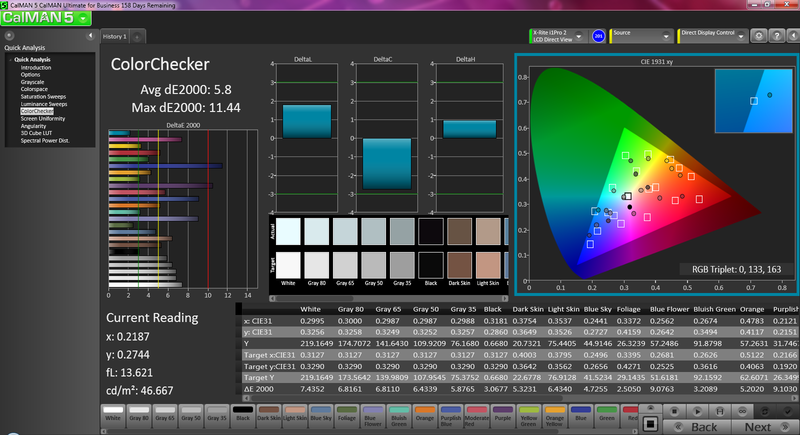 Color space coverage is about 51 percent of sRGB or 36 percent of AdobeRGB standards. 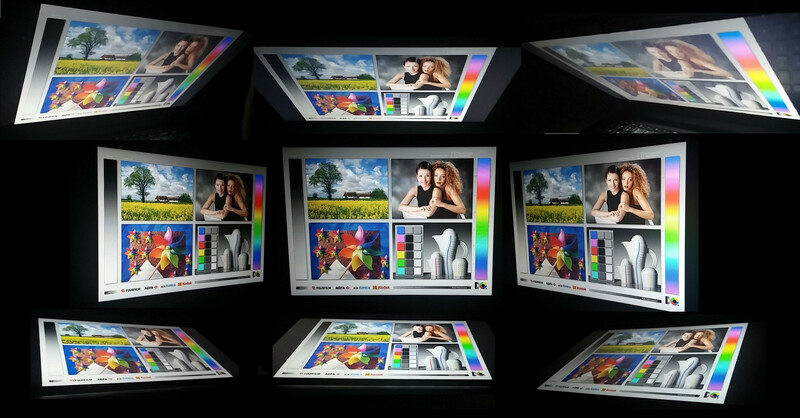 This is expected from a budget model as the Flex 2 15 was not designed for professional graphics use or meticulously accurate colors. Gamut is no better than on the Flex 2 14 and only slightly worse than the more expensive Yoga 2 Pro. Otherwise, colors are more than sufficient for typical day-to-day use. 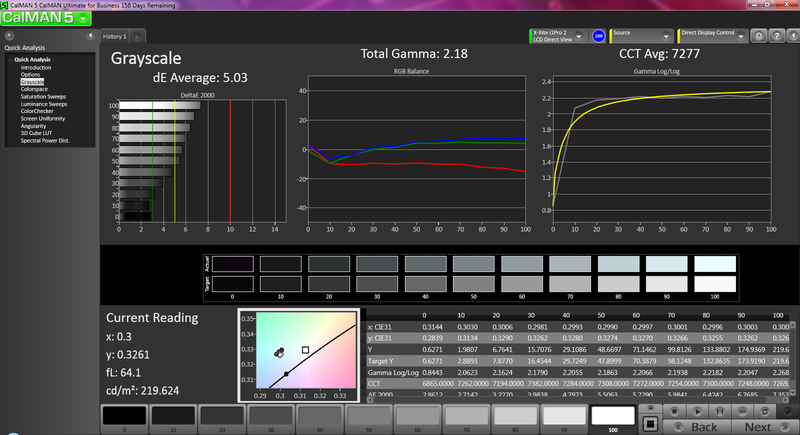 Further color analyses with an X-Rite spectrophotometer reveal very inaccurate colors on all tested saturation levels. 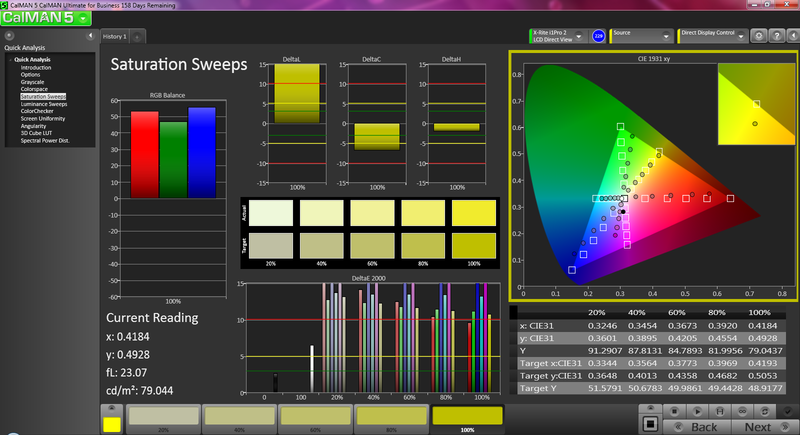 A quick calibration fixes the problem dramatically, especially for the colors red, green, teal and yellow. Unfortunately, blue, magenta, and grayscale see little improvements. However, we stress that such inaccuracies have little significance to the target audience of the Flex series. Outdoor usability is limited to not only the size and weight of the device, but also the glossy display and inadequate backlight. Maximum brightness will drop about 10 percent if unplugged from an AC source, which further discourages outdoor use. Should it be inevitable, we recommend the maximum brightness setting and working away from direct sunlight. 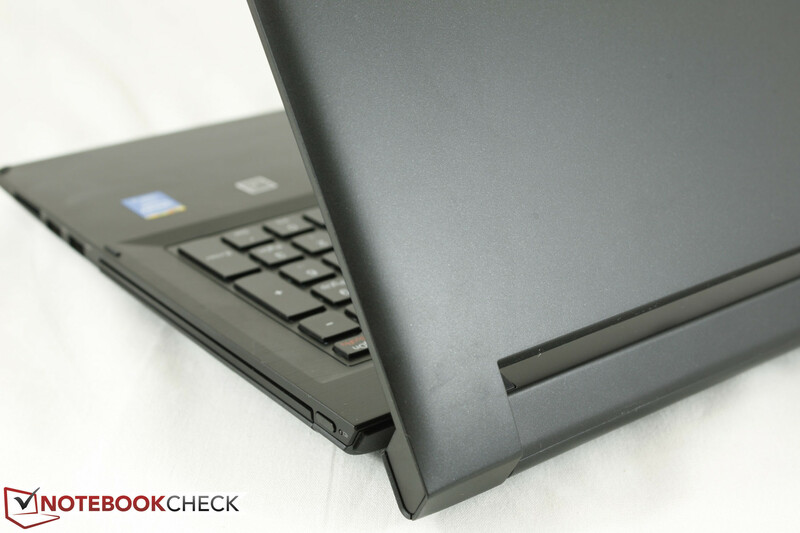 The flexible hinges and IPS screen do allow for wider viewing angles compared to most other notebooks and are advantageous for reducing glare. Viewing angles are typical for an IPS panel; distortions are much less severe from both horizontal and vertical angles. 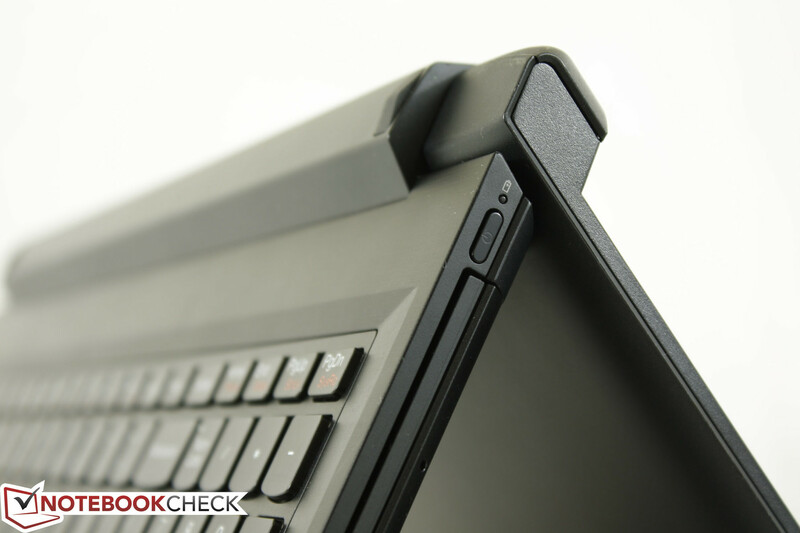 When combined with the 300 degree hinge, this gives the Flex 2 15 a leg up against competing models that have standard TN panels and regular hinges. 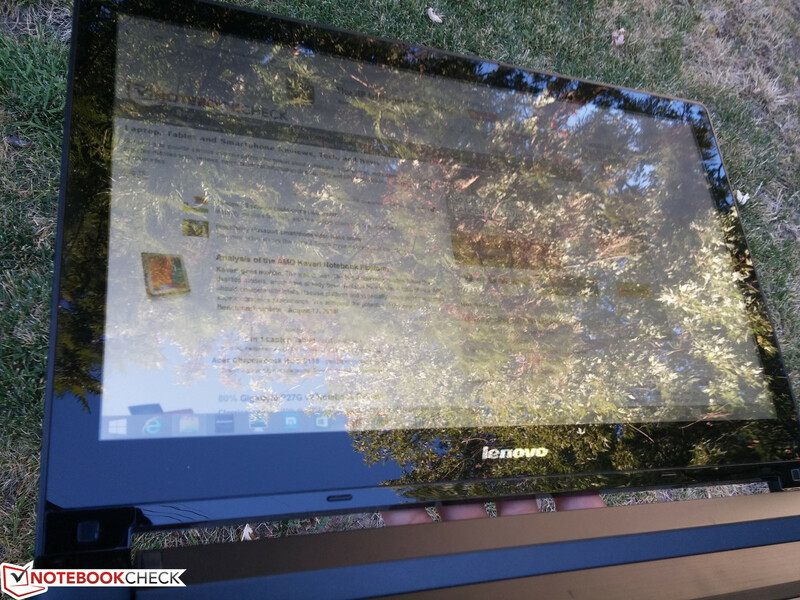 Thus, sharing onscreen content with others nearby is easy on the Lenovo no matter the mode. The manufacturer offers a wide range of configurations with ULV Haswell generation CPUs starting from a Core i3-4030U up to a Core i7-4510U. 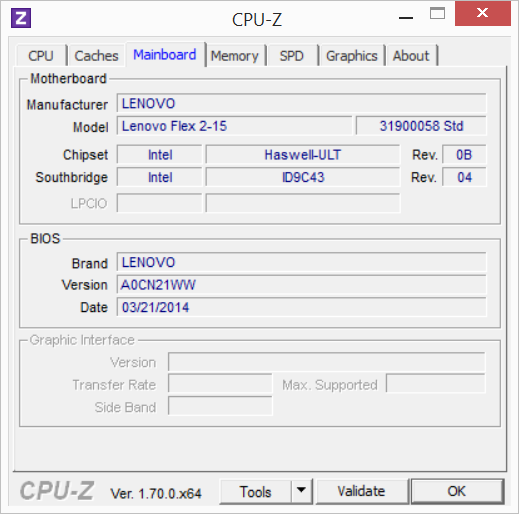 Our model at hand uses the more mid-range Core i5-4210U, which had only recently launched as of 2014. 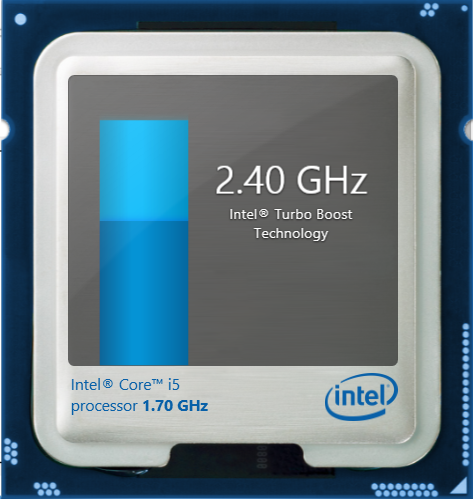 The 1.7 GHz dual-core CPU supports Turbo Boost up to 2.4 GHz for two active cores and will run at 800 MHz if on the Power Saver profile. 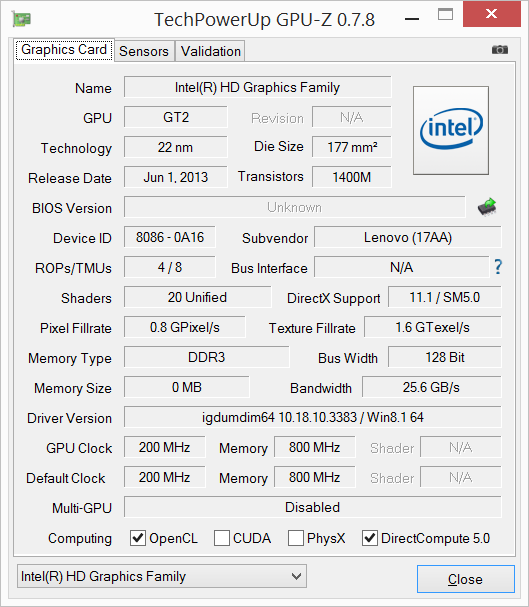 Graphics is provided by Intel's integrated HD 4400 solution with no other options. The GPU is rated for a base clock rate of 600/800 MHz core/memory and will run at 200 MHz and up to 1000 MHz on the Power Saver and High performance profiles, respectively. More information and benchmarks on the HD 4400 can be found in our full review here. RAM is available from 4 GB up to 8 GB depending on configuration. Our particular model is equipped with 4 GB and 2 GB PC3-12800 modules for a total of 6 GB. Removing the rear panel will reveal 2x SODIMM slots, the 2.5-inch SATA disk, WLAN card and the system fan. 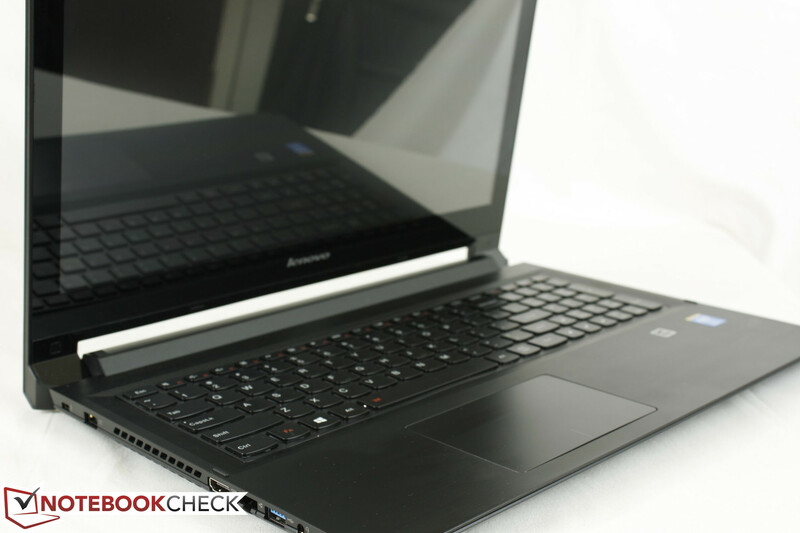 Lenovo provides a detailed maintenance manual for disassembly of the unit if needed. Since the i5-4210U is relatively new, our database currently holds just a few other samples for comparison including certain Inspiron 15 and Aspire V5 configurations. 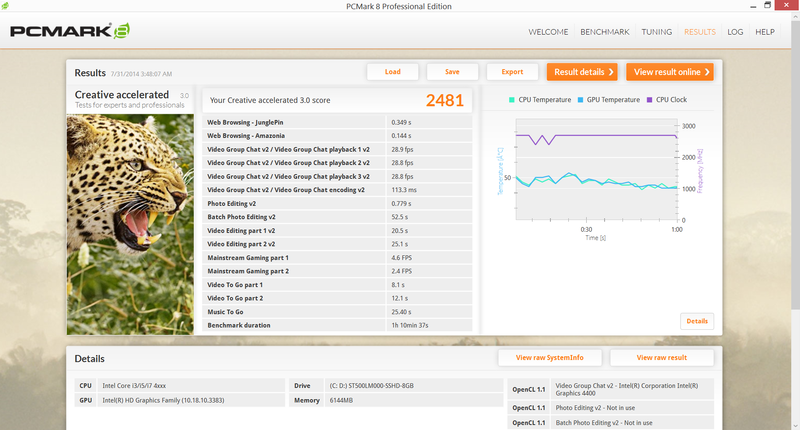 Nonetheless, we can compare the CPU to other processors in its category. 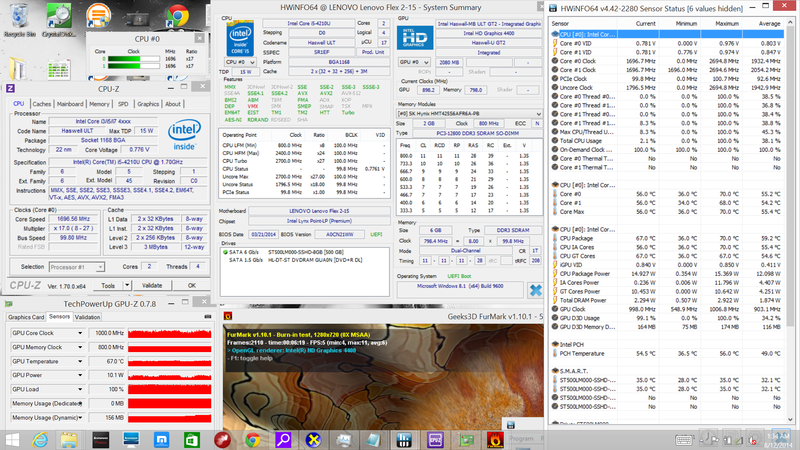 The multi-core wPrime and single-core Super Pi benchmarks place the i5-4210U in the same ballpark as the older Sandy Bridge i5-2557M or, more recently, the i5-4300U. 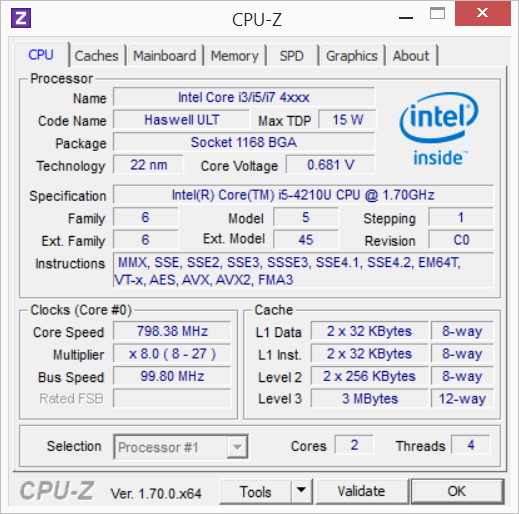 This is unsurprising as the i5-4210U and i5-2557M share the same clock rates and level caches whilst the Haswell model draws slightly less power and carries a much more powerful integrated GPU. For everyday browsing, multi-tasking and light gaming, the i5-4210U should prove sufficient. 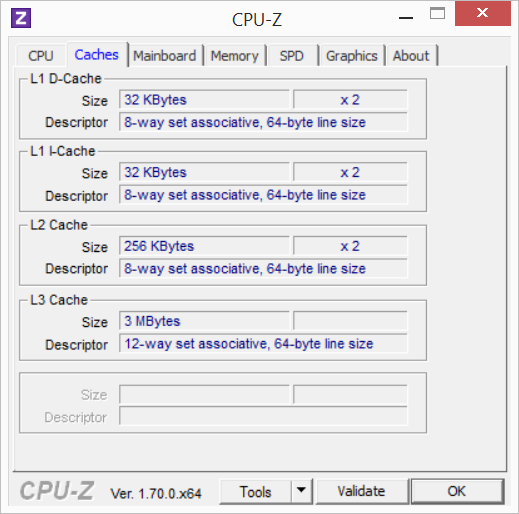 However, more power-hungry users may find the CPU lacking for moderate graphics or editing work. 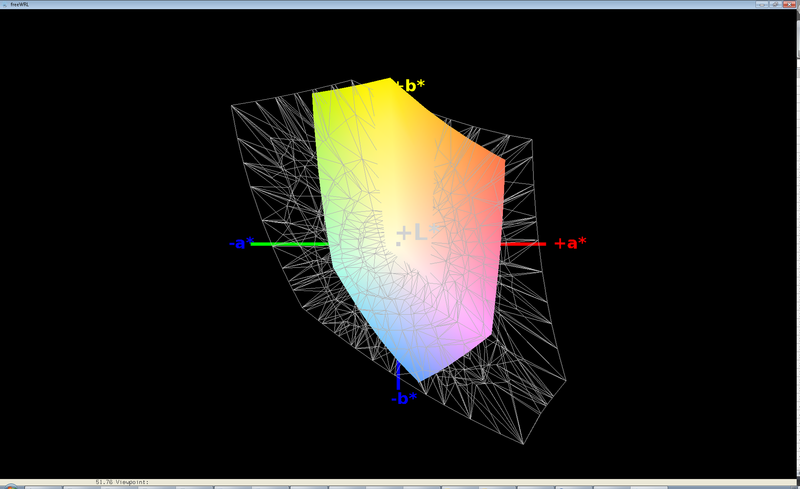 Turbo Boost is limited as expected from an ULV model as demonstrated in the Stress Test section below. 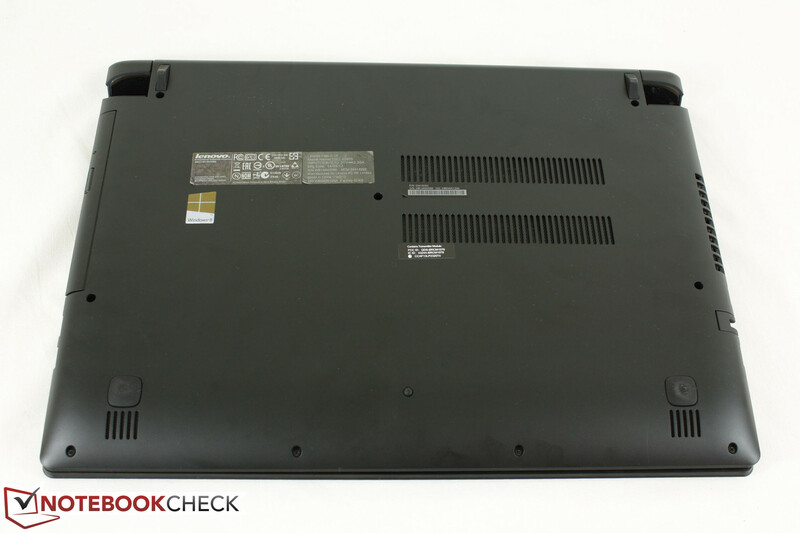 The final PCMark 7 score of 3725 points is good for a budget notebook and is similar to some older Ultrabooks including the Zenbook Prime UX31A. Compared to the similarly equipped Inspiron 15 and Aspire V5, the Lenovo scores higher than the former (3022 points) and is slightly lower than the latter (3935 points) as the Acer is equipped with more capable dedicated graphics. 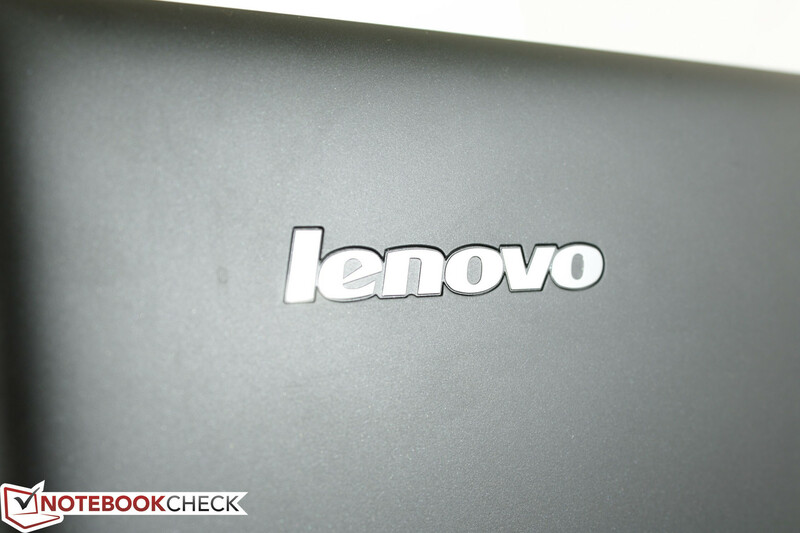 The more encompassing PCMark 8 benchmark, however, returns much lower scores for the Lenovo compared to the same notebooks. 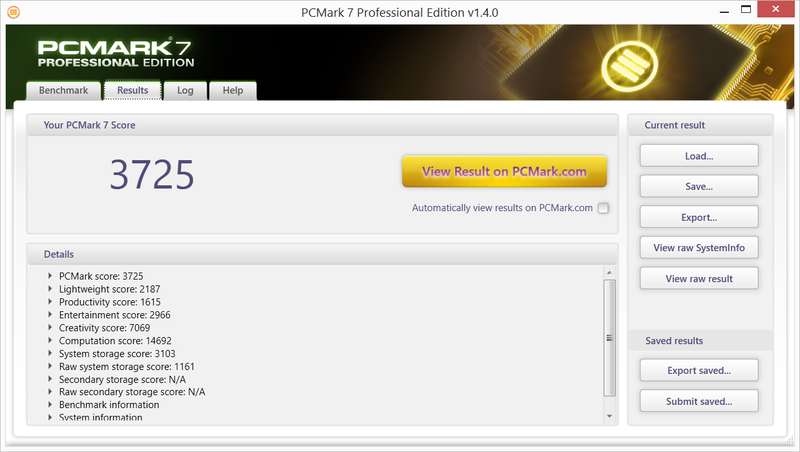 PCMark 8 Home v2 and Work v2, for example, are several hundred points higher on both the Dell and Acer models. 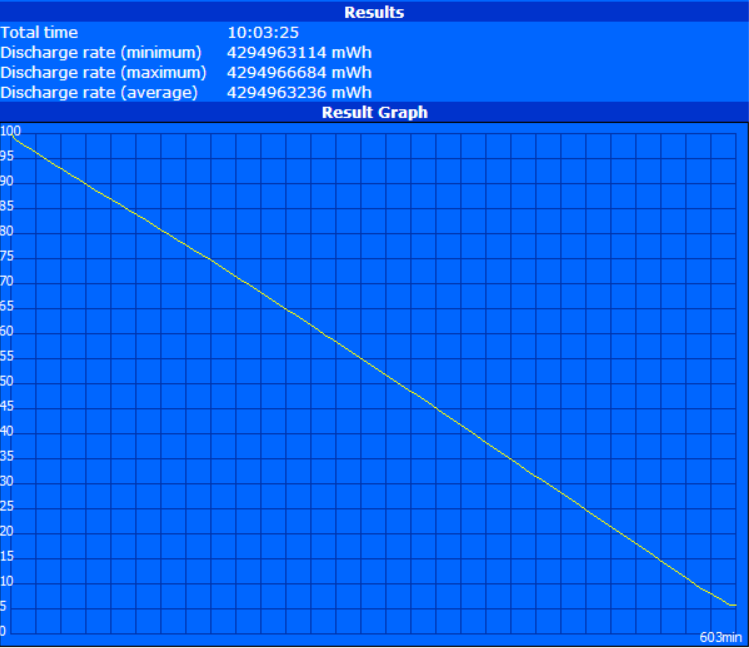 Subjectively, system performance feels average and sometimes even slow. The hybrid drive does little to help the 5400 RPM disk perform any faster and this can be felt when launching programs or installing software. 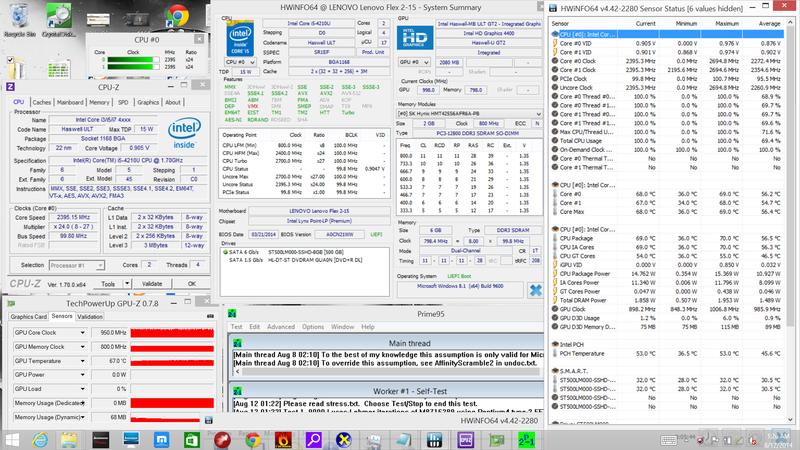 We stress the notebook with the benchmarks Prime95 and FurMark while running the monitoring tools HWiNFO, GPU-Z and CPU-Z to observe for any stability or throttling issues. With just Prime95 active, the i5-4210U CPU will run at a stable 2.2 to 2.4 GHz Turbo Boost and top out at 70 degrees C. With just FurMark active, the integrated GPU will run at a stable 650 to 750 MHz core clock and an 800 MHz memory. The core will occasionally jump to 900 MHz for very brief moments before falling back down to its base range. 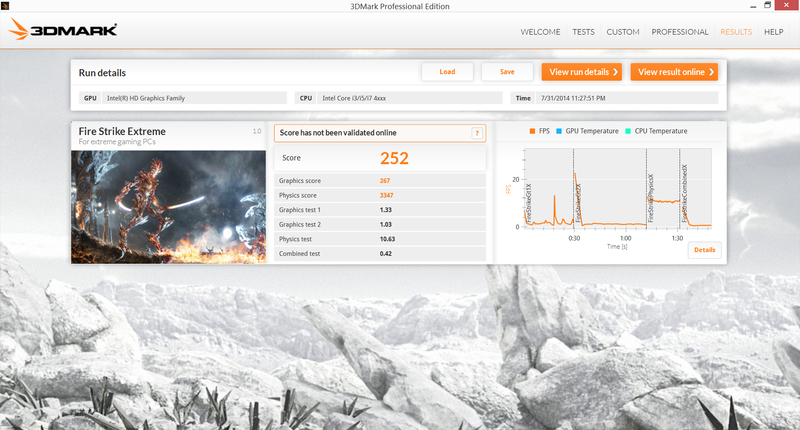 With both Prime95 and FurMark active simultaneously, both the CPU and GPU will drop in performance. 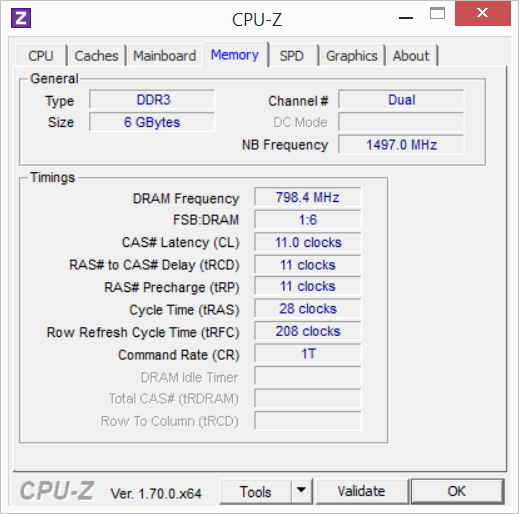 The CPU drops quickly to its base 1.7 GHz clock rate and throttle to a stable 1.2 GHz after a couple of minutes of full stress. The GPU experiences less severe throttling and will operate at a stable 550 to 600 MHz with occasional bumps to 700 to 750 MHz. Core temperature tops out at around 70 degrees C even after a full hour stress; this is compared to high-end quad-core models that can reach 95 degrees C under the same conditions. 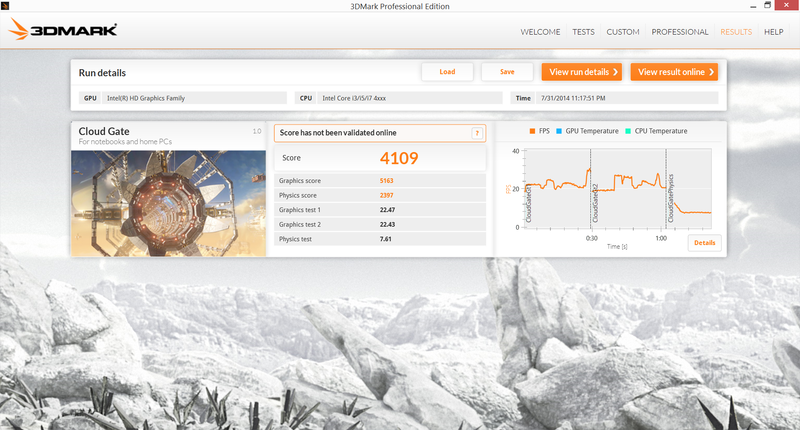 A 3DMark 11 run immediately following the stress test showed no notable differences in scores compared to a cold run, so throttling is not a huge issue during regular use. 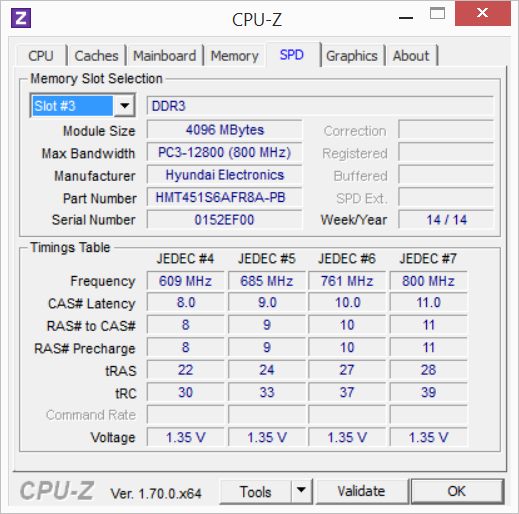 Running on batteries will not significantly throttle the CPU or GPU. 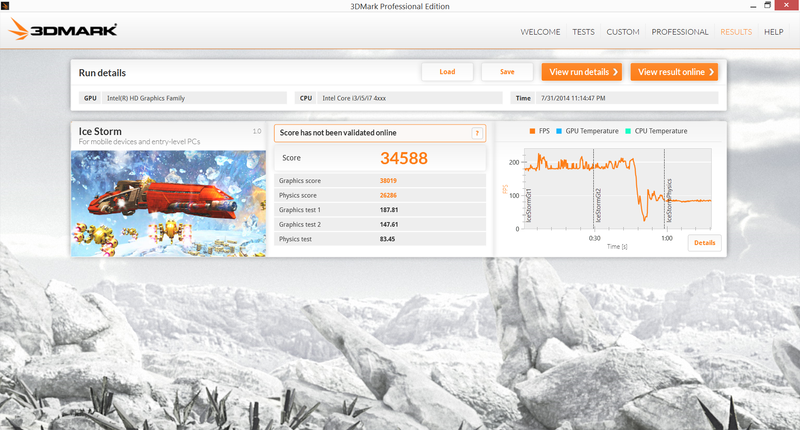 A 3DMark 11 test on batteries returns a Physics and GPU score of 3120 and 746 points, respectively, compared to 3256 and 798 points on a cold run. 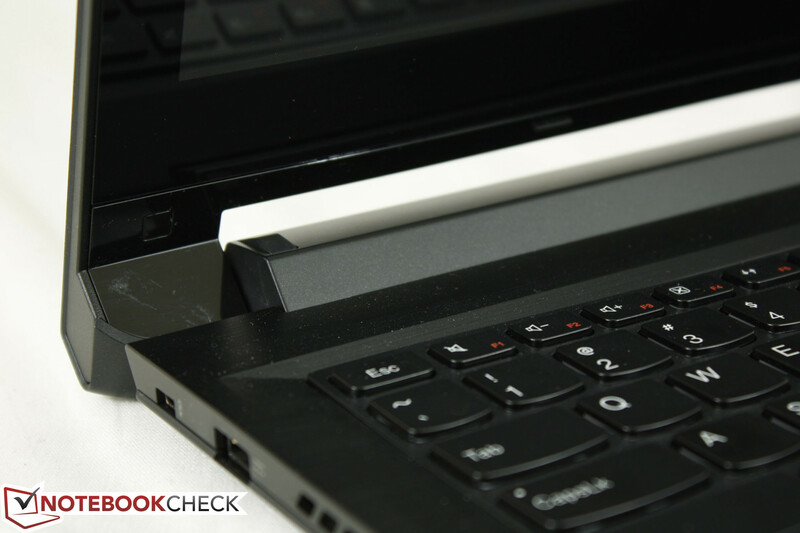 This ensures that users can utilize nearly the full performance of the notebook out of batteries alone if needed. All configurations of the Flex 2 15 carry hybrid drives from 500 GB up to 1 TB. No secondary internal storage options are available. 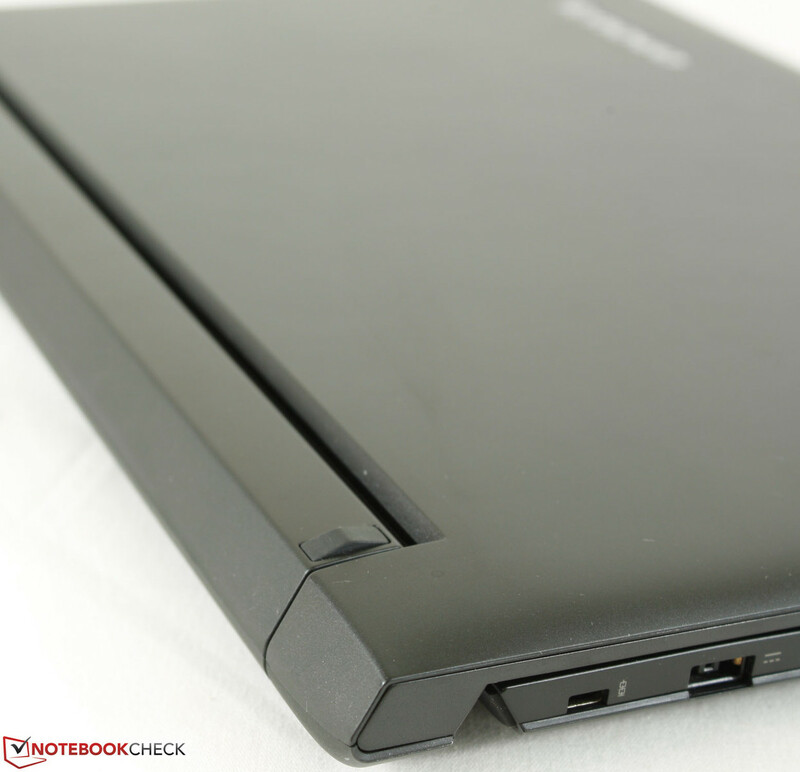 While budget notebooks tend to have high capacities, they also tend to be slow in response and access times. 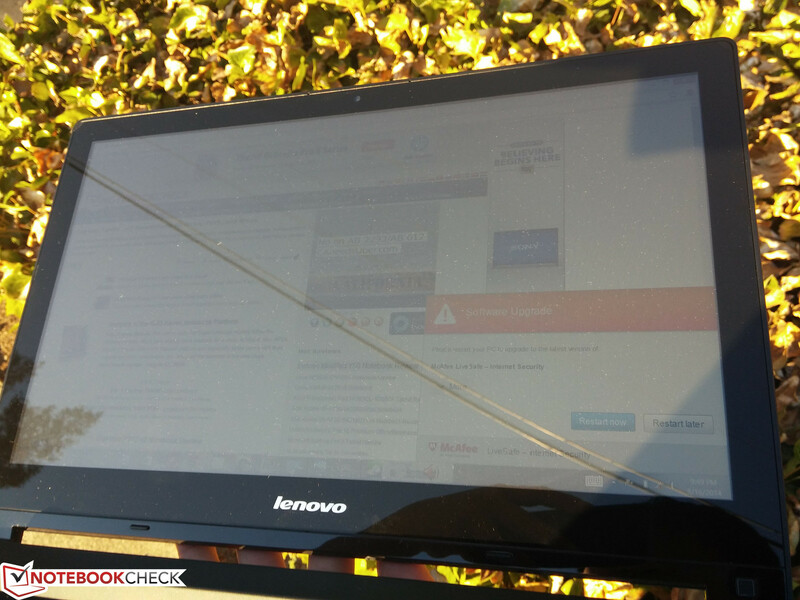 This Lenovo unfortunately suffers from the same fate. 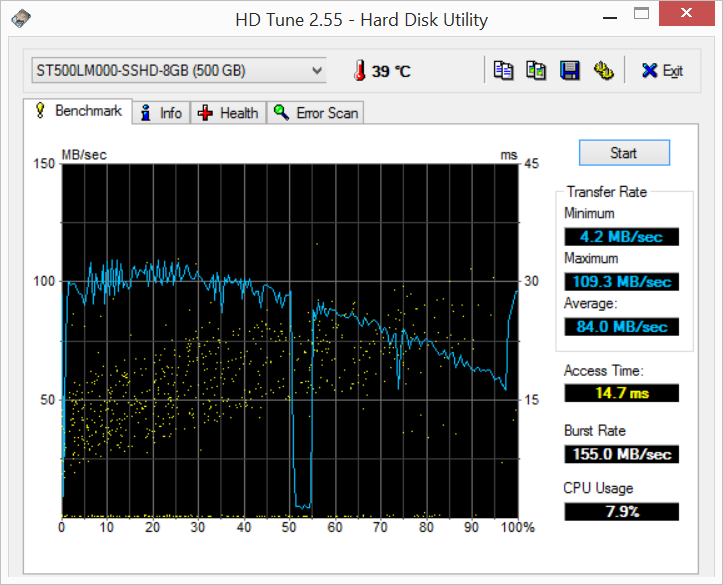 Our equipped Seagate ST500LM000 500 GB SSHD returns an average transfer rate of 84 MB/sec according to HD Tune, which is only slightly higher than standard 5400 RPM drives and still slower than many 7200 RPM drives. 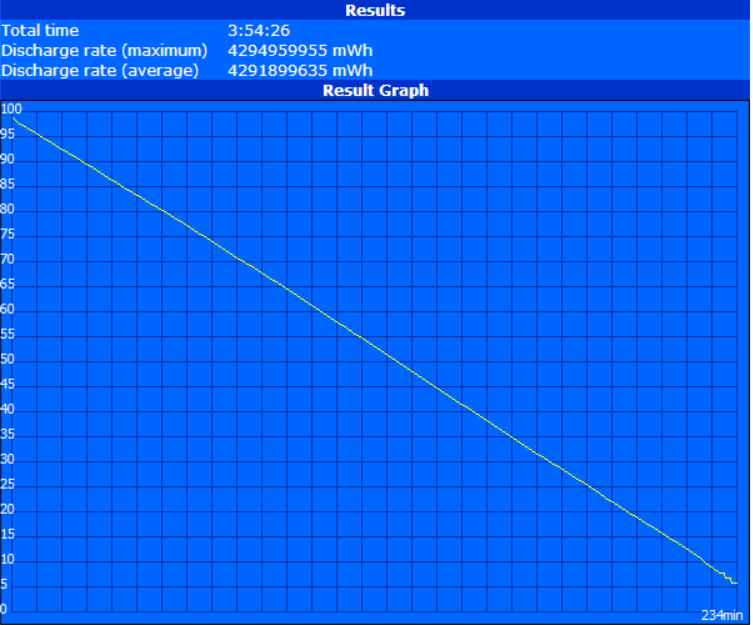 The 7200 RPM Hitachi drive in the Envy 15, for example, returns 92.7 MB/sec in the same benchmark. The very sharp decline in transfer rate during the Flex 2 15 HD Tune benchmark also signifies inconsistencies in maintaining reliable speeds. This is compared to hundreds of megabytes with nearly negligible access times from dedicated SSDs that are becoming increasingly common on Ultrabooks. Users looking to replace the SHDD will want to find a 7 mm thick drive as 9.5 mm drives may not mount correctly onto the drive bay. 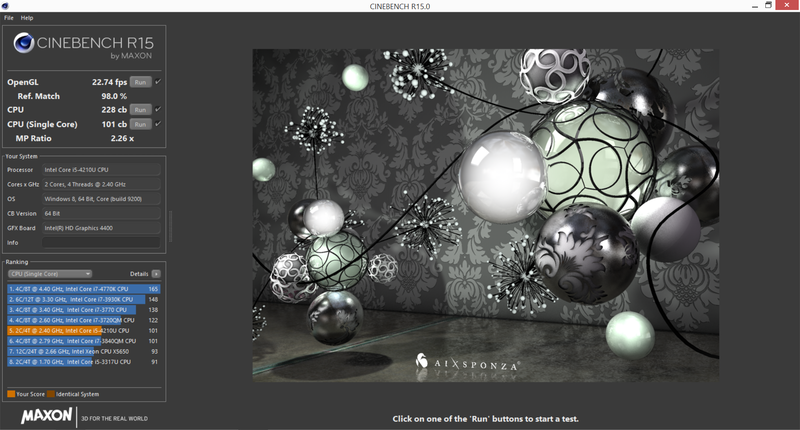 Graphics performance from the HD 4400 has been thoroughly analyzed in our full review of the integrated GPU and additional benchmarks can be found in our dedicated page here. As such, users should not be expecting to play any of today's 3D titles at a native 1080p resolution without suffering from greatly reduced frame rates and features. 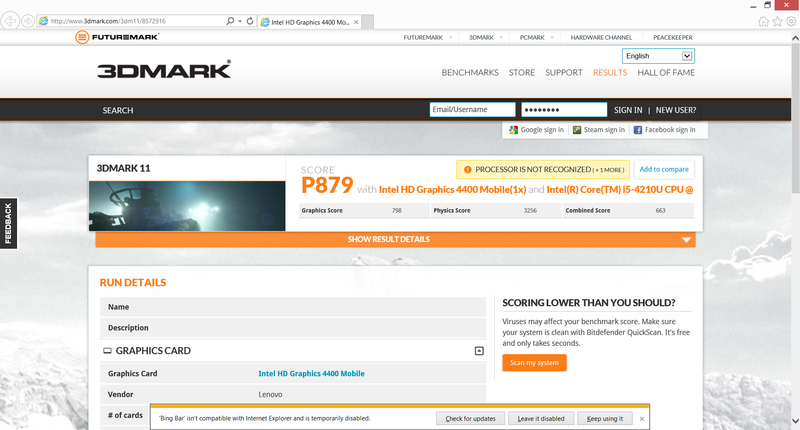 The synthetic benchmarks 3DMark 11 and 3DMark 2013 place the HD 4400 in our Lenovo close to other notebooks with the same GPU in our database. Less intensive and popular titles like DOTA 2 and Minecraft will run reasonably well, but modern first-person shooters will be severely limited. Most importantly, the GPU does not throttle significantly during high graphical loads, but at the same time it very rarely benefits from its maximum 1000 MHz core clock Turbo Boost. Fan noise is quiet at around 33 to 34 dB(A) when idling (compared to just <30 dB(A) on the Inspiron 15), but moderate multi-tasking or video playback will easily bump fan speeds to a more audible 36 to 37 dB(A) range. Fortunately, this is not enough to be bothersome at home or at the classroom. 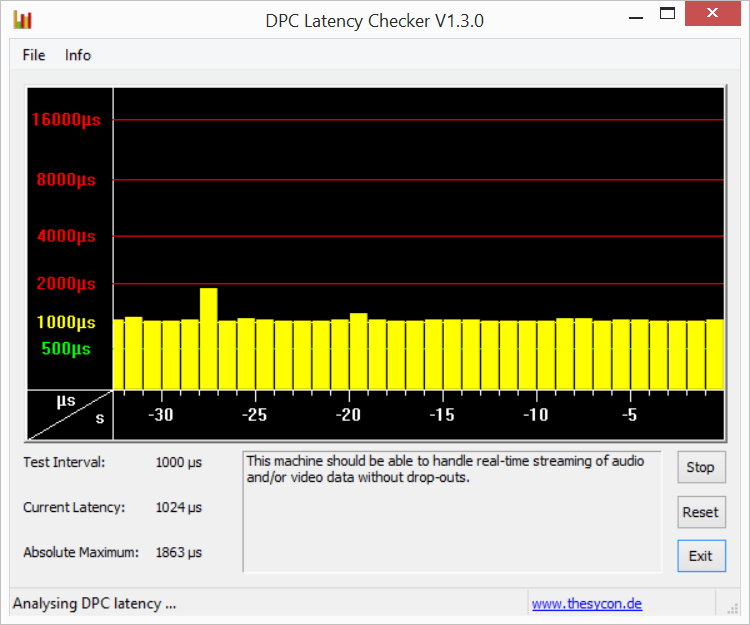 Full system stress on both the CPU and GPU will generate fan speeds of about 42 dB(A), which can become distracting in noise-sensitive areas. However, this maximum noise range is common amongst mainstream notebooks and is rarely ever reached during typical day-to-day use. 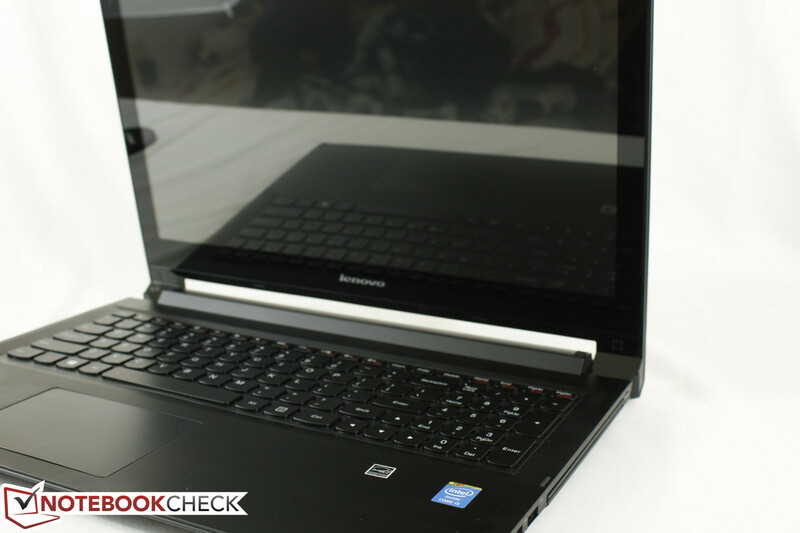 Gaming notebooks and certain Ultrabooks like the powerful Lenovo X1 Carbon models can and do become much louder much more quickly. Idling surface temperatures are more or less flat across the keyboard and palmrests. The bottom side of the notebook exhibits more of a delta between the coolest quadrant (~30 degrees C) and the warmest quadrant (~36 degrees C). 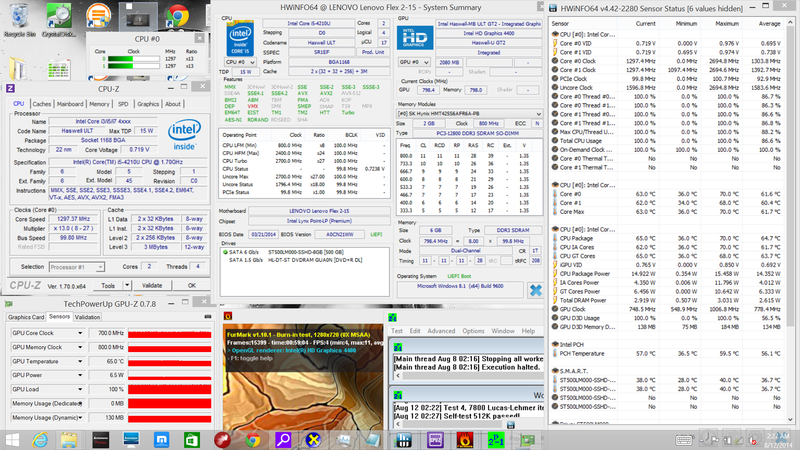 Under extreme loads for over an hour, the hottest quadrant was measured nearest the ventilation grilles and atop the CPU. Interestingly, the same spot is also the coolest spot when the system has been idle for some time. Conversely, the opposite side of the notebook stays relatively cool in comparison, especially on surfaces immediately adjacent to the hollow optical drive. This also means that a large temperature gradient can be felt from the left side of the keyboard (where the CPU and heat sink lie) compared to the right side of the keyboard. The palm rests show minimal temperature increases while the touchpad can become noticeably warmer. 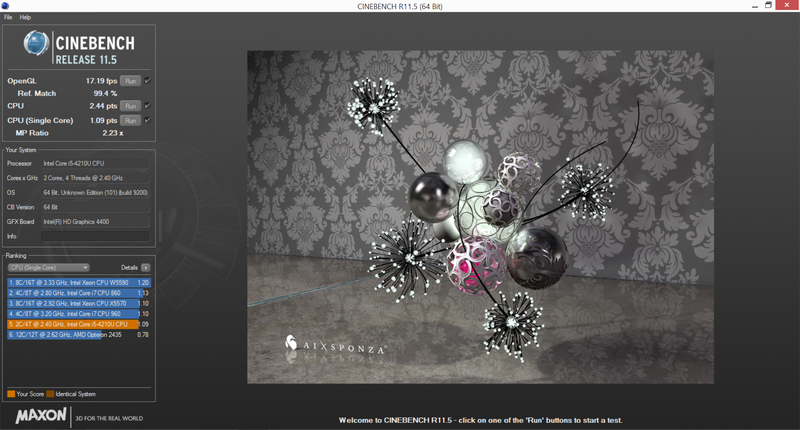 These same characteristics can be observed on the original Flex 15 as well. However, even under these extreme conditions, we still found the notebook to be comfortable to use on a desk. Sound quality and placement of speakers remain unchanged from the previous generation. Sounds feel muffled even at high volume and bass, of course, is lacking. 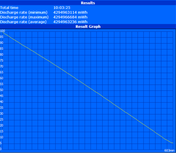 Furthermore, the Realtek HD Audio Manager offers little in terms of options and effects. External 3.5 mm solutions are definitely recommended for movies and music. All Flex 2 15 models include a built-in 4-cell 32 Wh Li-ion battery, which is the same capacity as the battery on the original Flex 15. There are no higher or lower capacity options available. 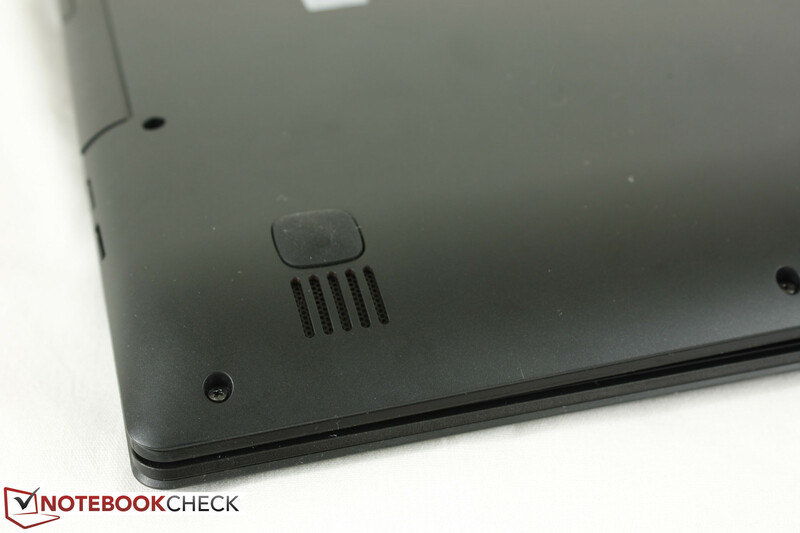 The battery on the new Flex, however, is built-in and the panel underneath the notebook must be removed first before the battery becomes accessible. This is in direct contrast to the original Flex model where the battery can be quickly replaced from the rear. Overall battery life is slightly better than the original model in our WLAN test where we put the notebook at 150 nits brightness (setting 9/10) whilst running our standard browser script until automatic shutdown. 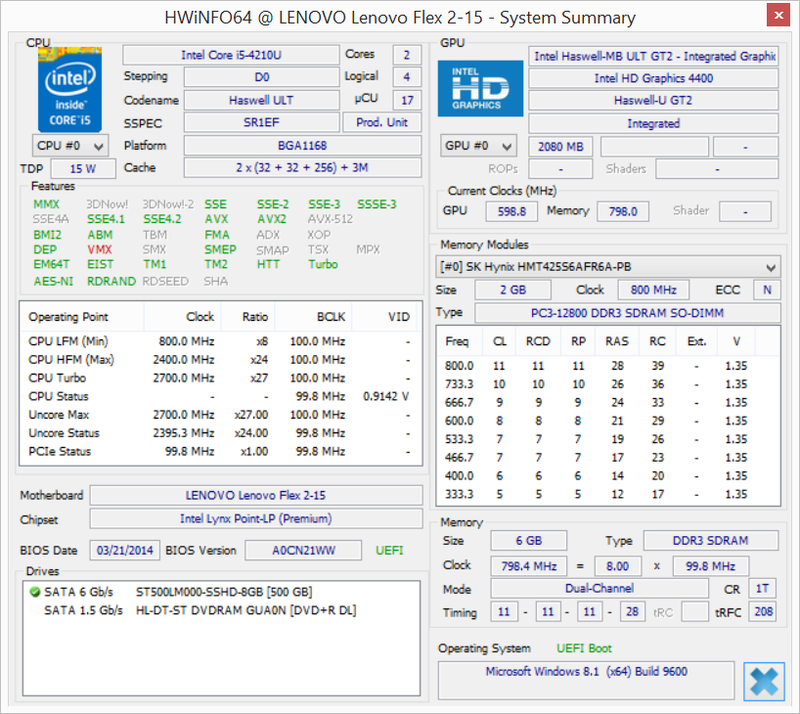 The Flex 2 15 was able to last for almost 4 hours under these conditions compared to 3 hours and 40 minutes on the previous model. Our maximum runtime test, however, returned much better results at just over 10 hours compared to 7 hours on the last Flex model, so users who like to reduce screen brightness and other system settings may find that they are able to squeeze out a bit more life from the Flex 2 15. With that said, 4 hours of constant use is common in this category. 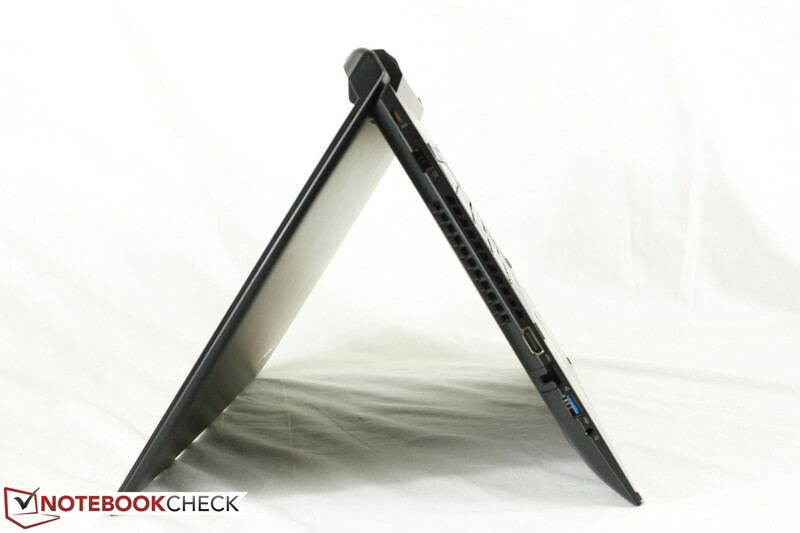 The 15.6-inch ATIV Book 2 and Pavilion 15-n005sg notebooks, for example, have similar runtimes under the same testing conditions and similar battery capacities. At its core, the Flex 2 15 is a no frills solution for the home or student user in need of a basic notebook for browsing, email, and other light activities. 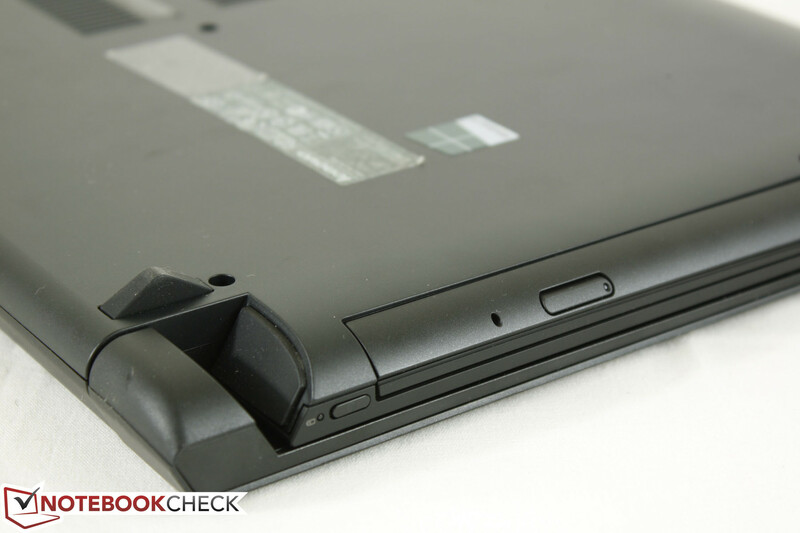 Look past the novel hinge and "flexing" of the device and you have a standard budget notebook at heart with no real surprises or exciting options and features. Compared to the outgoing model, the new Flex is a slight improvement with regards to some aesthetics and positioning of ports, but not much else can be said. 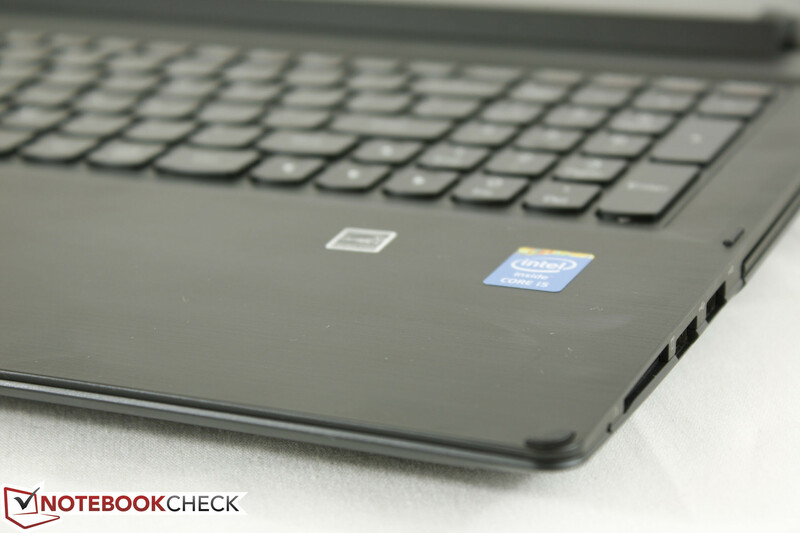 The outer display and keyboard still warp under pressure and the hybrid drive doesn't hold a candle to newer Ultrabooks on the market with dedicated SSDs. The largely unchanged keyboard and touchpad could both use some major improvements in terms of feedback and tactility. 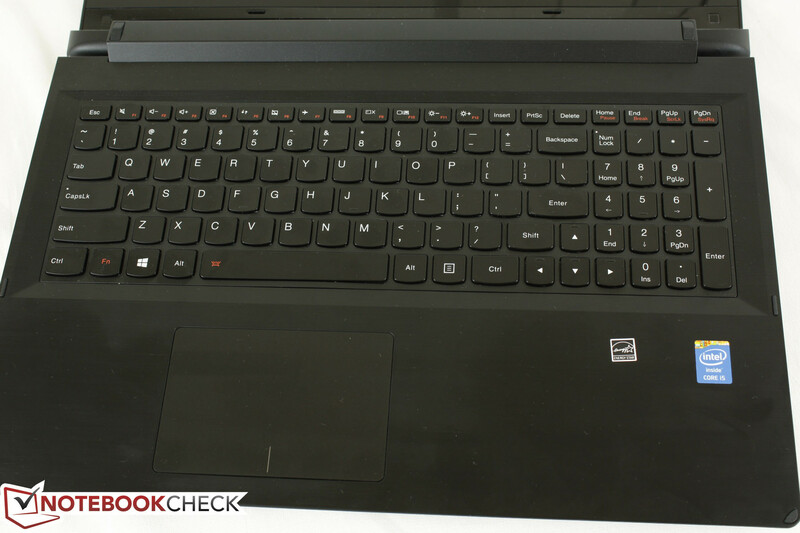 Otherwise, most everything else is in line with what we expect from a budget notebook including its run-of-the-mill display backlight and battery life. A notable highlight of the Flex 2 15 is its 1080p IPS display, which looks better than the TN displays found on many competing budget models. However, such a configuration will run users $999 compared to the 768p $549 base model, so it's a hard recommendation as users can certainly do better than the Flex 2 15 with prices nearing four digits. 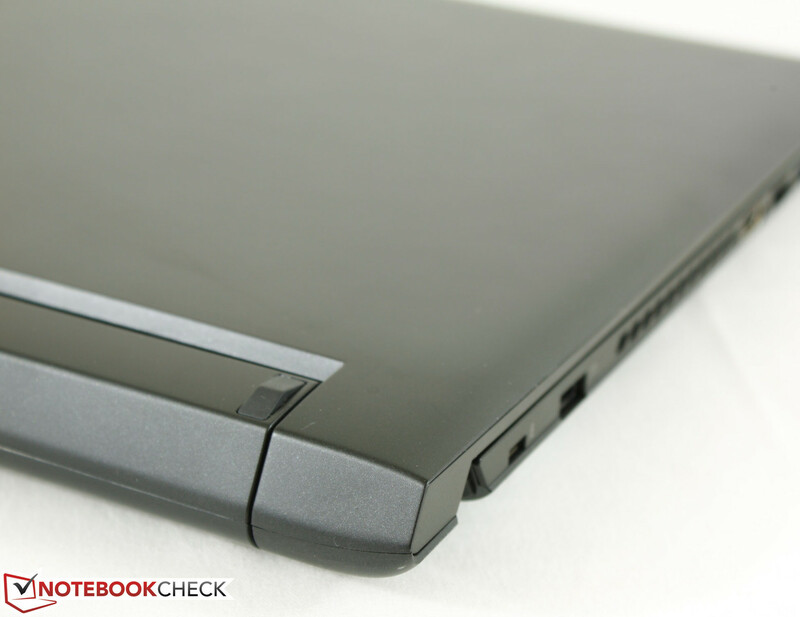 While the base model has some draws, we suggest looking into the much better Lenovo Yoga series once configurations go beyond $700. 1080p IPS option for very wide viewing angles. 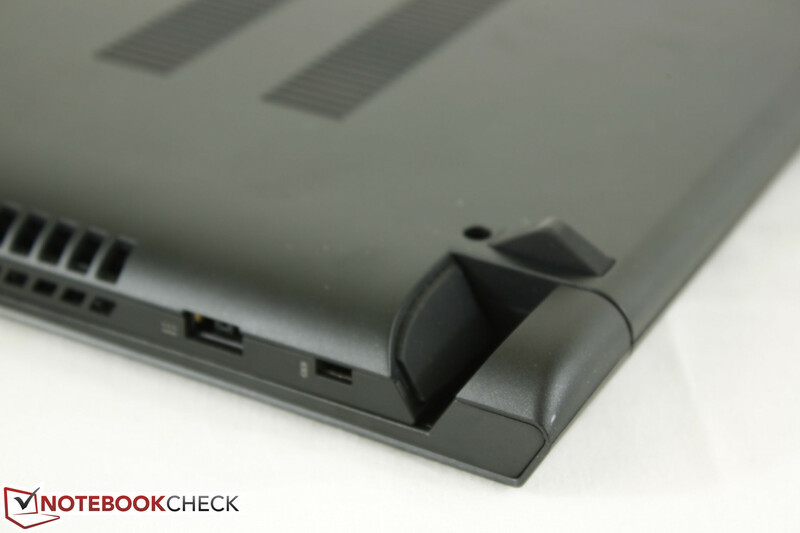 Removable panel underneath allows for end-user upgrades. The rearranged ports have made room for an optical drive. Removable battery and improved keyboard and touchpad. 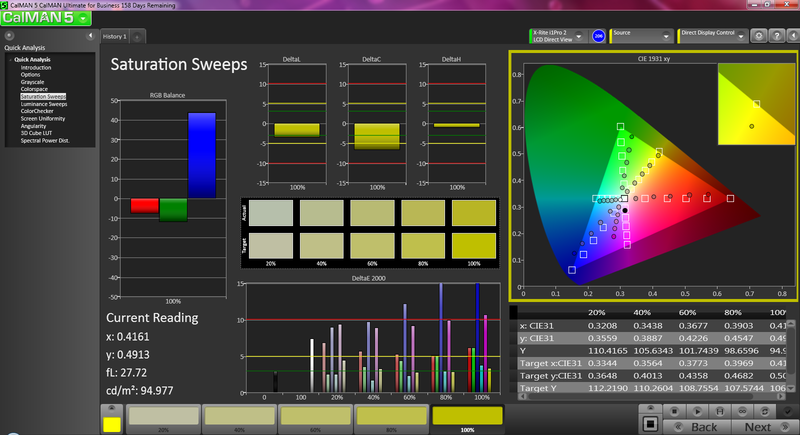 The 1080p IPS configuration could be less expensive. 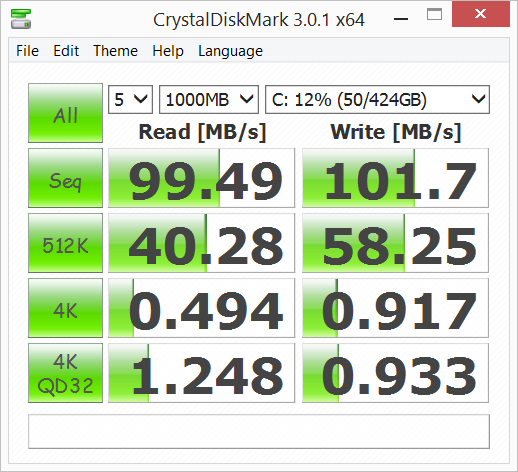 Dedicated 7200 RPM drive options may be preferable over 5400 RPM SSHD. 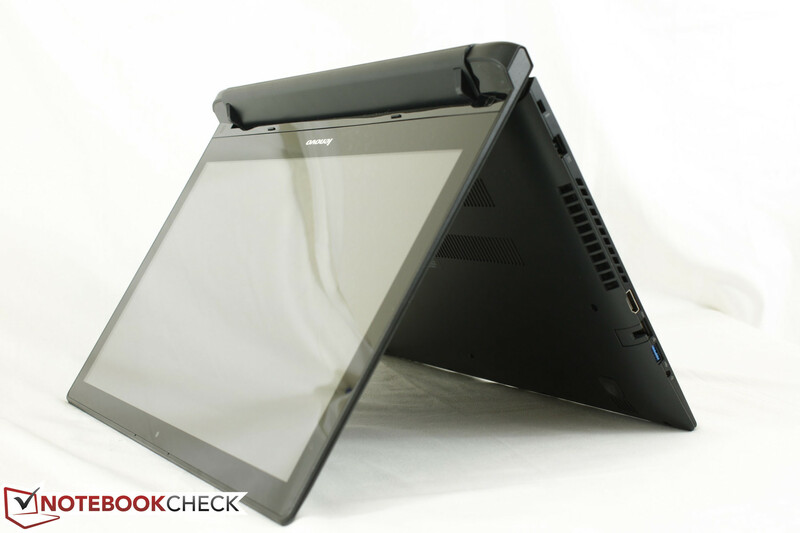 Great 1080p IPS display for a budget-class notebook.